CB William Gay was benched last week in favor of CB Greg Toler. This is a situation to monitor closely as it was just two seasons ago when Toler put up 82 solos. Could end up being a very sneaky pickup. Eagles waived LB Brian Rolle. Look for Jamar Chaney and/or Akeem Jordan to assume the WLB duties. Not much fantasy value here at all. Troy Polamalu looks like he will play this week. Solid DB2. Redskins SS Brandon Meriweather will be out "at least a week" with a left MCL/PCL injury. Reed Doughty started in Meriweather's place following his pre-game collision Sunday. Giants SS Kenny Phillips has been diagnosed with a sprained right MCL, and is week-to-week. Will Witherspoon rotated heavily with Zac Diles at linebacker last week. Colin McCarthy looks like he will be back this week, but Witherspoon should be dumped either way. 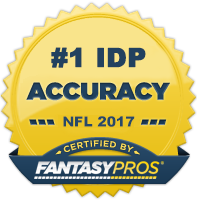 Studs such as Jared Allen, Cameron Wake, Charles Johnson, and George Wilson all had very nice weeks and are back on the path to IDP stardom. Bobby Wagner had a nice game, but he still isn't playing in subpackages. Until he does, I would avoid him as anything other than a LB4+. With the Jets losing Santonio Holmes for the year with a foot fracture, they could very well end up being the worst offense in the league. This could mean a big spike in tackle opportunity for LB David Harris. He's been outstanding the last couple of weeks and has a top tier tackle matchup this week against Houston. He has LB1 potential ROS. I would also upgrade LaRon Landry and Yeremiah Bell as well. RDE Cameron Wake (MIA) - I've been preaching patience with Wake the last couple of weeks. Leading up to last week, he led the league in QB hurries/hits, however had no sacks to show for it. That changed last week when he destroyed the Arizona Cardinals with 4.5 sacks. He's a DL1 moving forward and should be owned in all formats. If someone was dumb/impatient enough to drop him, scoop him up now! RDE John Abraham (ATL) - Abraham leads all current NFL players in sacks. However, Father Time is starting to catch up to the 13 year veteran and he doesn't receive nearly the amount of snaps he use to in his younger days. His limited snap count is keeping him more fresh however and he has 3 sacks so far this season. He has a nice matchup against the Redskins this week and is a top 10 DL play in balanced and sack-heavy scoring formats. DT Henry Melton (CHI) - Melton has consistently been beating interior linemen off the ball and last week against Dallas was no exception. He's had a sack in 3 of the first 4 weeks and I expect that trend to continue this week against the Jacksonville Jaguars. He's a solid DL3 option. LDE Everson Griffen (MIN) - Griffin doesn't receive enough playing time to be counted on as anything more than a long shot DL3, deep league DL4 type player at this point. But he has had 3 sacks so far this season and with Jared Allen gaining more effectiveness, Griffin should see more one-on-one matchup opportunities in the interior. Not a superb play, but you could do worse this week. WLB Vontaze Burfict (CIN) - Ever since Thomas Howard went on IR after Week 1, I've been keeping a close eye on the Cincinnati WLB position. I think Burfict is the real deal and has a chance to be the best fantasy linebacker on the team come year's end. He's an instinctive player who has a knack for being around the ball. The coaches like him and most importantly, he has little competition for tackles. He's worth a LB4 roster spot in 10 and 12 team leagues. WILB Pat Angerer (IND) - Angerer looks like he will make his season debut this week against the Green Bay Packers. There's no reason why he shouldn't be on your roster if he is still sitting on the waiver wire (unless you are already stacked at LB). He was a stud last year and will be a stud this year as long as he's healthy. MLB Colin McCarthy (TEN) - This is an obvious one. Coaches said McCarthy looked great in practice and he is looking like a good bet to start against the Vikings this week. If by some chance, he's still on your waiver wire, pick him up. LB1 with top 5 potential. LOLB James Harrison (PIT) - Similar to Angerer, Harrison will likely see his first game action of the season this week. He goes up against Michael Vick and the Eagles. Although he's suffered some significant injuries over the last couple of seasons, Harrison is as tough as they come and has shown that he can play quite effectively even when not at 100%. He's a guy that I always like to take a chance on if I need big production out of my LB3/4 spot and am willing to get a bit risky. SILB Demorrio Williams (SD) - This is going to be a one week waiver wire pickup suggestion. Williams is not a starer. However, he plays in all of San Diego's nickel packages and with the Saints on the schedule this week, he will figure to see 80-85% of the snaps. Historically, he's produced when he's played. If you are looking for a LB4 in super deep leagues to start this week, Williams is a nice option. SS Jordan Babineaux (TEN) - Babineaux has been on this list before, so I won't expel too much about him. In short, he's a mediocre player in a great situation. The Titans are receiving a ton of tackle opportunity and will likely continue to receive a ton as the season wears on. He's a solid DB2+, especially in tackle-heavy leagues. FS Matt Giordano (OAK) - Due to the injuries at the CB position, the Raiders have temporarily moved Michael Huff from free safety to cornerback. Giordano has taken his place at safety and his put up good numbers during that time. We've seen similar production from Giordano in short starter stints last season. He should be counted on for 5-7 solos per game. FS Rahim Moore (DEN) - Moore, a 2nd round pick out of UCLA last season, has started to emerge as one of the better young players on the Broncos roster. He's still 22 years old and still suffers from consistency problems, but his upside is high enough in certain matchups to use him as a bye week/injury DB3 filler. He has the Chargers and Patriots in his next two matchups and has a good chance of exceeding expectations in those weeks and perhaps beyond. FS Malcolm Jenkins (NO) - For most of his career, Jenkins has failed to make a big splash in the tackle column on an extended basis. However, the Saints' defense has been on the field for larger spans of time this season which has led to an increased amount of tackle opportunity. Add in a weaker front seven and you have a recipe for a significant increase in tackle production. So far through four games, Jenkins has registered 33 total tackles. He has a very good matchup this week against the Chargers and should be started with confidence.